We have carved a niche as one of the most preeminent Crusader Helmet exporters in India. The Imperial Crusader Helmet offered by us is a true replica of the helmet worn by the crusaders. Moreover, the unmatched quality, inexplicable finish and elegant look have played a vital role in the enhancement of the demand of Medieval Crusader Helmet in international market. 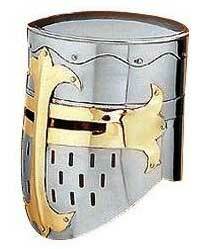 Customers are also eased with the availability of Crusader Knight Helmet in varied specifications.